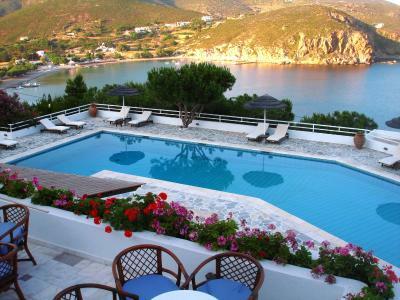 Lock in a great price for Patmos Paradise Hotel – rated 8.5 by recent guests! The view! We've traveled all over Greece and this was the best view by far. Not in town, but not too far which made it peaceful and relaxing. The staff was exceptionally helpful. Next time we will stay MUCH longer! Welcoming, professional, resourceful and polite management and staff. Hotel features tastefully decorated and modern rooms and bar etc., spaces with a panoramic view over the beautiful cove below. The unique location facilitates easy access by car or foot to the series of beaches along the coast, arguably the best on the island, which are both family friendly and perfect for couples. The beach closest to the hotel being organized and featuring a bar, beach bar/restaurant, authentic fish tavern and the best ski school on Patmos. Great location near the beach and nice pool. Very friendly and attentive staff, quite helpful during our stay, excellent service at the bar. I love the location! It’s the 4th time we stay in this hotel & we’re always very pleased! 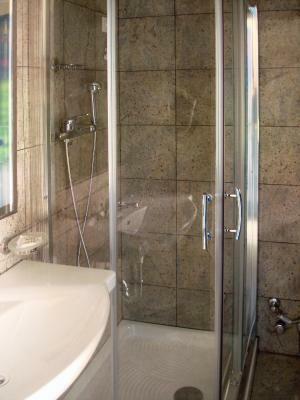 It is extremely clean with friendly staff! The nicest staff I have encountered in Greece so far. Very helpful and always talking with a smile. Close to George's beach bar. There is also another bar in the middle of the beach: they offer free umbrella and beach chairs. 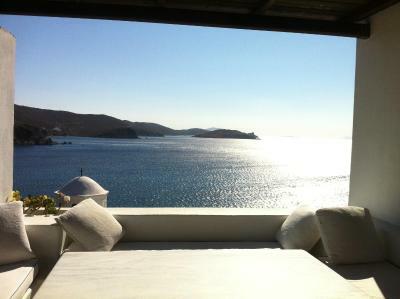 Very relaxing spot in Patmos. Great place! We loved sunrise on our balcony. Staff helpfull. A variety of Blues and Ambiental music form the bar in daytime fulfils relaxing atmosphere. Man with beard on reception desk is a man of good taste for music, food and lifestyle. His recomendations are to be respected if you like real seafood catched by the fisherman that day. Will come here again, that's for sure! Great location, fantastic sea view from our room, excellent service, great environment, and last but not least very friendly and professional staff. The perfect view over the see, quiet. The combination of a soft and a hard matras. 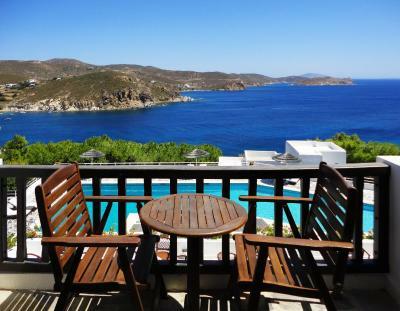 Patmos Paradise Hotel This rating is a reflection of how the property compares to the industry standard when it comes to price, facilities and services available. It's based on a self-evaluation by the property. Use this rating to help choose your stay! 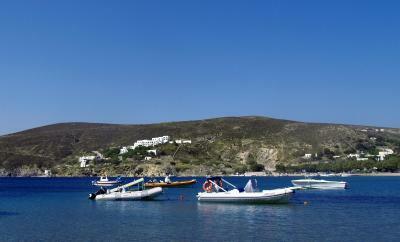 Patmos Paradise Hotel is located 650 feet from the lively beach of Kambos. 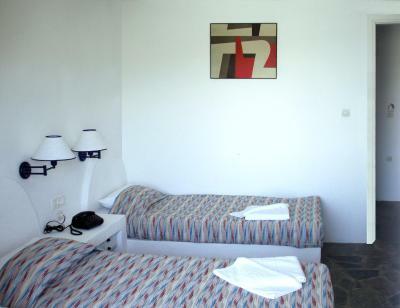 All rooms have balconies and feature air conditioning, a fridge, and satellite TV. 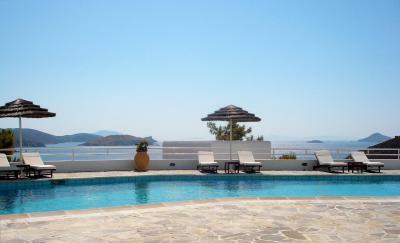 Facilities include an outdoor pool with panoramic views over Kambos Bay. 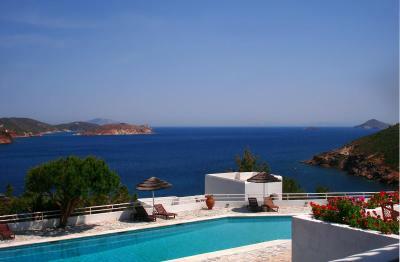 The Patmos Paradise Hotel has free Wi-Fi at the lobby and pool area. 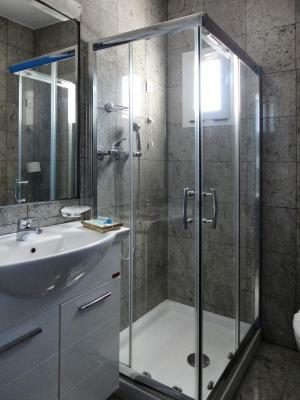 A squash court and sauna is available to guests. 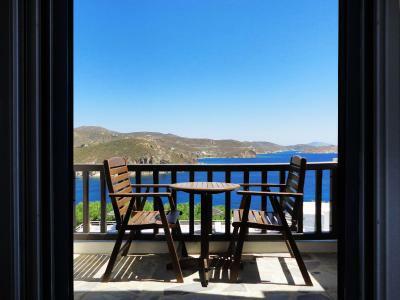 The hotel's hillside location offers guests a panoramic view of the southern coastline of Patmos and the horizon of the eastern Aegean Sea. 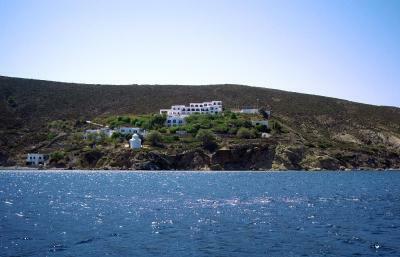 There is a regular local bus service to the main port of Skala and the citadel of Chora. Wind surfing, paragliding, and water skiing are activities available at the beach. Free parking is possible outside the hotel. 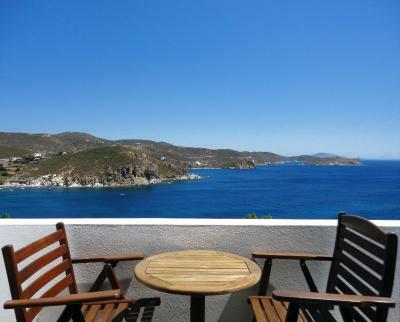 When would you like to stay at Patmos Paradise Hotel? This room opens to a balcony with panoramic sea views. This room opens to a balcony with direct sea view. 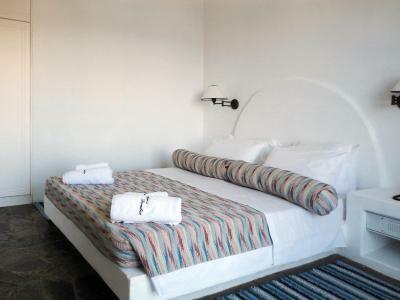 Offering more space, this Cycladic-style suite enjoys views of the Aegean Sea from its furnished balcony. 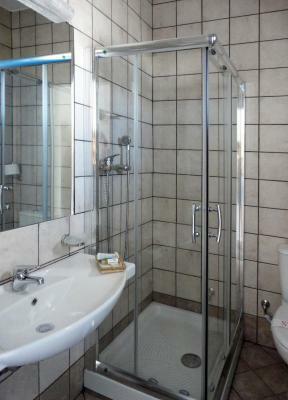 It also offers a satellite TV, mini fridge and hairdryer. These rooms face the front building and the garden. 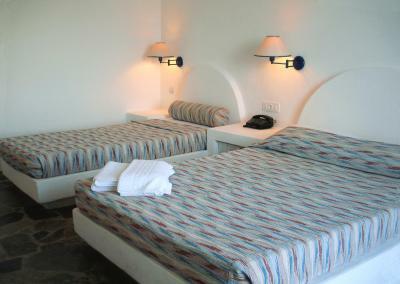 Cycladic-style room with air conditioning, satellite TV, mini fridge and hairdryer. 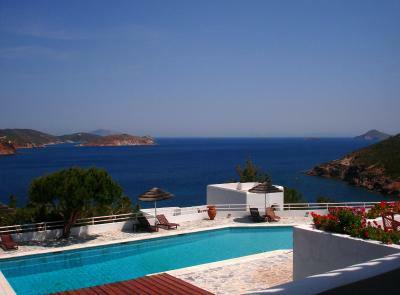 It offers views of the pool and the Aegean Sea. Offers view to the gardens. 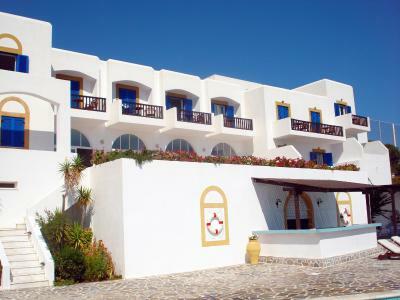 Patmos Paradise Hotel was build in 1993 and its situated 200m from the golden sandy beach of the Village of Kambos, a rural village located at a beautiful sand bay with lovely white houses in the Aegean style. 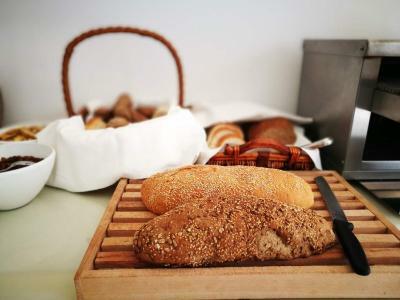 The guests can enjoy the unspoiled nature where fishers and farmers are your next door neighbors. 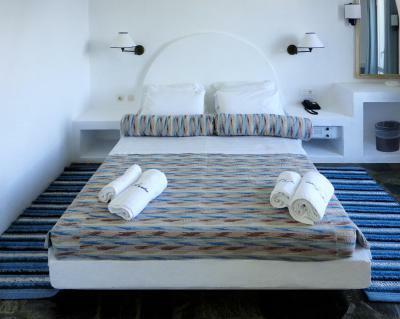 House Rules Patmos Paradise Hotel takes special requests – add in the next step! 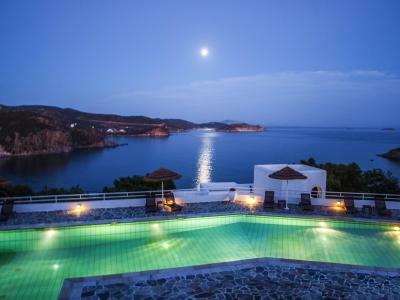 Patmos Paradise Hotel accepts these cards and reserves the right to temporarily hold an amount prior to arrival. Reception staff could use some training. 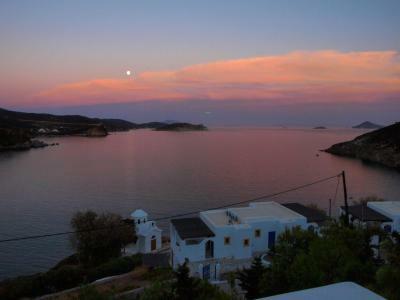 Amazing view and location is perfect for the beach and for the restaurant in the evening. The staff is amazing,polite,kind and super active to satisfy any kind of request. 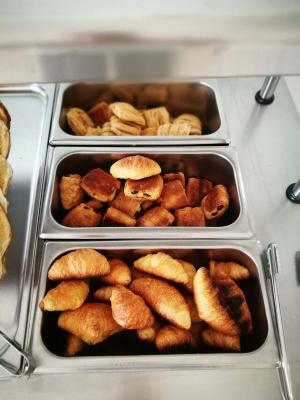 Amazing breakfast,very rich and tasty! The pool is quiet and with a great view! Don't think this is a downside so much as me not planning ahead and getting an international licence, but... It is distant from pretty much everything. 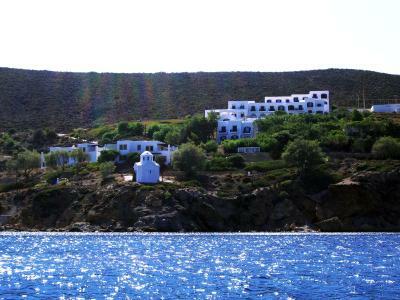 About a 10 min drive to the port town of Skala and a 15-20min drive to the capital, Chora Village. I would recommend that you hire your own car to get around the island as it makes it so much easier and cheaper. 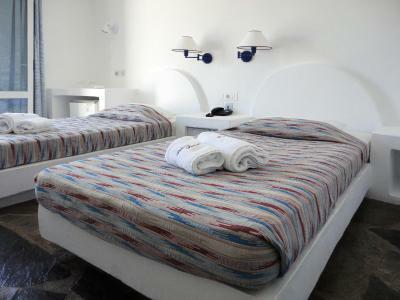 I love this hotel and all its white-stoned, blue-doored Greek simplicity. The view of Kampos Bay is absolutely breathtaking. 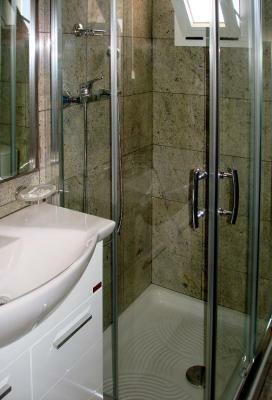 The staff were friendly and welcoming and the service was exceptional and very accommodating. Reception waited for us even though the Ferry came after midnight. Just email them to let them know in advance. You can rent a car directly from the hotel. 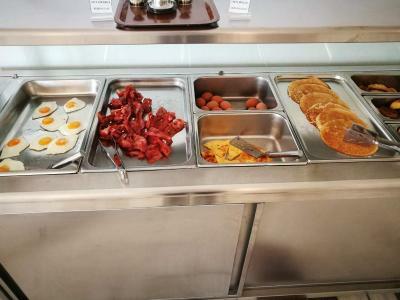 And although they don't serve lunch or dinner, there is an all day bar service that makes club sandwiches so you can spend the whole day relaxing by the pool without having to go anywhere if you dont want to. A 5 minute walk to the nearest beach, Kampos Bay. You have a pick of many different restaurants and there is live music some nights. The best part is eating right on the beach! Beautiful hot. Amazing view. Lovely, accomodating staff. You need a car, the walk to the beach is very steep. There is no atmosphere in the hotel. The poolbar was closed. It has great potential, a beautiful pool. 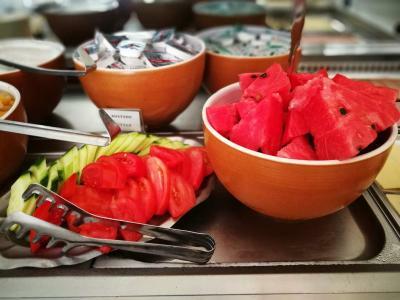 Breakfast is very basic & fruits they have is from a tin can instead of fresh. Very very poor internet connection. The beach is made of pebbles. Not easy to get in the water. Better to stay at the pool. The stairs, but only because I have bad knees. However, it would not keep me from staying there again. Quite a lot of steps before you reach your room, no elevator. 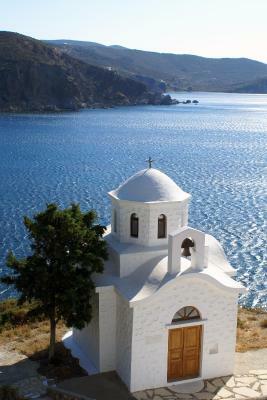 My short vacation with my husband at Patmos paradise was the best i had this year! The hotel has all necessary comforts. The position and the view is breathtaking and its worth staying here in order to feel this experience. Swimming in the pool while gazing at the Aegean sea and the bay of kampos and feeling the calm is something unforgettable. The staff was constantly there to offer anything we would need. They were very friendly, professional and helpful with all the information we needed. We couldn't skip enjoying a nice glass of wine with now favourite scenery. 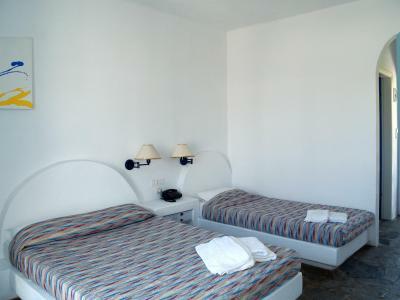 The rooms as well were properly equipped and comfortable. We can't wait to visit this place again as soon as possible. 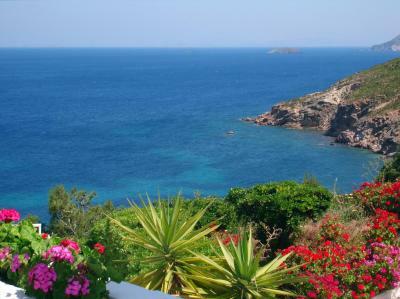 We believe that its the best location on the island and definitely the best value for money! The view from the room (sea view) at the hotel is absolutely beautiful. Staff is friendly.